I love to run. Love it. Unfortunately, I have a rare medical condition called Hobbit-feet. My feet are short, stubby, extra-wide, and extra-thick. Which makes being a runner…interesting at times. Mostly, it limits my running shoe choices to models available in 4E (extra-wide), and even then, I am incredibly prone to blisters on my toes because the shoes are still not actually wide enough. Recently, I had a big problem with blisters on the sides of my big toes. My Asics Nimbus 14s (extra-wide 4E, too!) were rubbing the thick calluses to shreds. It hurt to run, and it hurt to walk, and at its worst, it hurt even to stand up for a few hours after a run. And you know, with my plan to run a half-marathon in the fall, that’s just not gonna work for me. Needless to say, I went online to look for a solution. And as luck would have it, I think I found it. Not only did Zappos exchange my Nimbus 14s for a new pair that’s a half-size up, but I checked my email and found that New-Skin wants to work with me as a brand ambassador. I had already been looking online at various bandages and tapes and such to keep the blisters/calluses protected and sealed while I run, and a few places suggested liquid bandages. 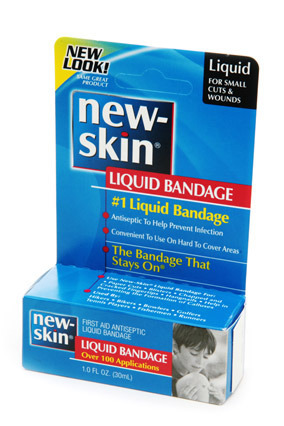 When I saw that a brand of liquid bandages wanted to work with me, I jumped at the chance. So I filled out my information, set up my accounts, and then waited anxiously to get the package in the mail that New-Skin was going to send me. After all of the pain these stupid blisters had put me through over the past couple months, I was all about getting to try this New-Skin liquid bandage stuff. The runner’s toolkit they sent came in a few days ago, and I’ve been able to run using the New-Skin product twice now. I’ve been using the spray-on liquid bandage initially, and while it’s cold to apply, it dries quickly and actually coats my feet pretty well. I have to admit, I was skeptical at first because I was afraid the texture of the New-Skin would be tacky and gross. I figured it would stick to my socks (or worse, make my toes stick together in my shoe). But from what I can tell so far, the liquid bandage leaves no tackiness, and it actually protects the blisters and sore spots I was having. My toes haven’t been torn to shreds this week. I also have been spraying the liquid bandage across the ball of my left foot while I’m walking on the treadmill. And so far, the tiny bit of rawness I’d been dealing with from my weird treadmill-gait has been taken care of. As a part of this brand ambassador gig, I will be posting periodic updates to my half-marathon training over the next 90 days. And since blisters and such were such a major issue for me beforehand, anyway, I’m excited to see how the NewSkin products will affect how I’m doing. As I start increasing mileage, I’m going to have to be careful to make sure that even minor injuries–blisters, calluses, chaffing in unmentionable areas, and all that fun runner stuff–doesn’t derail my progress. So I see it as a kind of serendipity that a few days after I really get my head in the game and start to train for this half, I get a brand ambassador gig for a product that I actually need. Have any of you ever tried NewSkin? New-Skin® recently conducted a survey finding that 66% of people cite general fitness, exercise, conditioning and overall well-being as their motivation or reason for running. New-Skin has been providing active skin protection for over 100 years. Get outdoors and be active with New-Skin. This is a sponsored conversation written by me on behalf of New-Skin. The opinions and text are all mine. This is a sponsored conversation written by me on behalf of New-Skin. The opinions and text are all mine. I’m actually running into that so far. It’s adding a few minutes to my prep before and after the runs, which isn’t too bad, but it’s something else to get used to. I’m not used to having to wait to be able to put on my shoes, but since it’s the first week of giving it a shot, if it makes the blisters go away or stop forming, I’ll take my few minutes to peel it after I run. Like Ocho, I have only New-Skin as a first aid tool. But it works great of hangnails and such. I have abottle in my desk at work, and at home. I’ve never tried it in an athletic context, though.